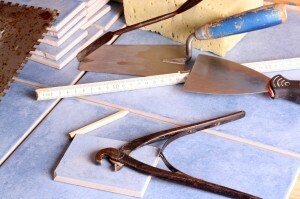 Fitting tiles in the kitchen is a popular choice among many homeowners, and with good reason. Tiles act as an effective splash-back to the sink, with their water resistant quality providing an attractive alternative to paint or wallpaper. They’re also great at reflecting light, which is good for increasing the sense of space in small kitchens as well as making the most of the room’s natural light sources. Tiles are also very easy to clean, making them one of the most hygienic elements that you can have in your kitchen. And that’s not to ignore the huge design potential of kitchen tiles. Available in almost any colour, you can use tiles to create patterns or mosaics, or simply go for one bank of colour in differing shades to give your design that nuanced edge. What’s more, you can combine tiles with other forms of decoration to give your kitchen a varied and versatile look. And don’t worry about having to replace them every few years or so, as tiles are usually very durable and hardwearing. While they’re perhaps more vulnerable to chipping than other surfaces, they’re also relatively simple to repair and replace. But how do you go about choosing and fitting kitchen tiles? In terms of the type of tile you choose, ceramics are by far the most popular type of material and will work well in virtually any kitchen. This is partly because they conduct heat so well, meaning that they can accommodate hot pans and keep the kitchen cool in hot weather, but it’s also due to their impressive cost-effectiveness. They’re also available in a wide range of shapes, sizes and colours, meaning that they offer the most flexibility in aesthetic terms. Once you’ve got that to hand, you’ll need to deal with the electrics. Make sure the power is off before removing the covers of your switches and sockets, and then use a sponge to clean the wall. Use a rag to get it dry again, and then apply a small amount of adhesive to the wall. You’ll want to work in small steps, because if you apply too much adhesive then you’ll be in a rush to fit the tiles before it dries out. It’s also a good idea to start from the centre and then work out towards the edges. When placing the first tile, hold it gently against the adhesive to ensure that it’s firmly in place and then use the plastic spacers to help line it up with the other tiles. Use your spirit level to make sure it’s not at a funny angle, before repeating this process with the rest of the tiles. When you get to the outer edges, use the tile cutter to get the right fit. When everything is in place, then you can start to grout in between the tiles. Make sure the grout is spread evenly and use a sponge to get rid of any excess. Once that’s done, you just need to wait around 5 or 6 hours for the grout to dry before giving it a final once over with the sponge. And there you have it. 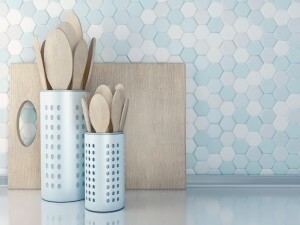 Fitting your tiles really is as simple as that, which is why they’re such a great choice for some casual kitchen DIY. Previous Article Can Your Kitchen Colour Scheme Really Affect Your Mood? Next Article What Makes Great Bedroom Design?